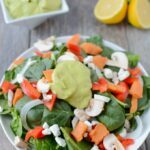 Thick, creamy & flavorful, this Ginger Citrus Avocado Dressing will take your salad to the next level. It’s gluten-free, vegan, paleo & ready in minutes! Combine first 5 ingredients in a blender or food processor and process until smooth. For a thinner dressing, add additional citrus juice or water until desired consistency is reached.